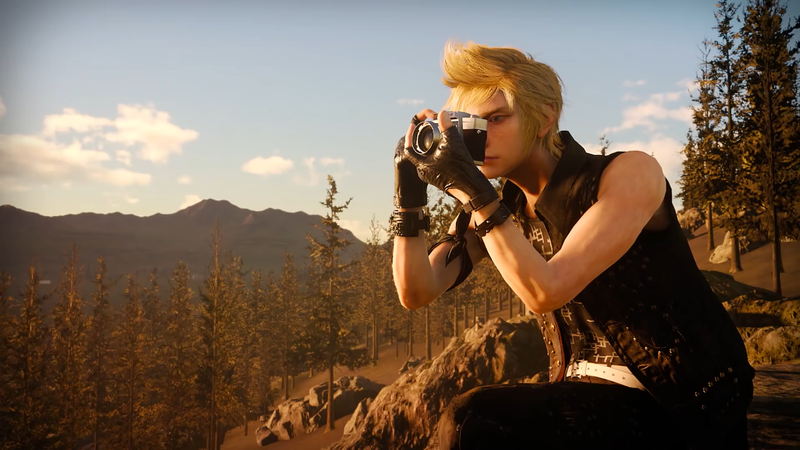 Photography is a Skill in Final Fantasy XV. Prompto saves pictures of all the places he visits with his companions. You’ll take pictures of various places, from superb and picturesque photo-spots to the ordinary and mundane. Your photography skill level increases by taking photos. You’ll become better at taking photos as your photo level increases allowing you to take selfies and apply effects. Periodically the game will show you photographs that Prompto has taken. These photos can be shared on social media. With the new updated on 1/24/16, players can now take photos themselves whenever they'd like. 2 New Filter: Roadtrip Adds a new filter "Roadtrip"
3 New Filter: Memory Adds a new filter "Memory"
5 New Filter: Dawn Adds a new filter "Dawn"
7 New Filter: Bloom Adds a new filter "Bloom"
9 New Filter: Journey Adds a new filter "Journey"
10 Self-Timer Not 100% sure, but it seems Prompto will now take photographs of himself during battle. Confirmed: Allows for pictures to be taken as though from a Tripod with a Timer. Giving the option for Prompto to be selected, in the morning car ride, as the primary focus for the day.